Win a pair of Cambridge Audio S30 hi-fi speakers! | What Hi-Fi? 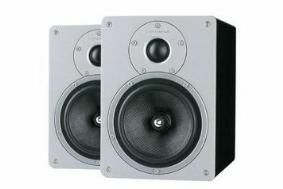 Win a pair of Cambridge Audio S30 hi-fi speakers! Cambridge Audio has been bringing authentic hi-fi thrills to the masses for more than 40 years. It's turned out more than its fair share of memorable products in that time, and the S30 loudspeakers can safely be counted among them. In the best Cambridge Audio tradition, they're handsome little standmounters that look and sound a deal more expensive than they are. We first fell for the S30s in July 2007, and as recently as our January 2009 issue we were alliterating like mad, using words like 'emotion', 'excitement' and 'engaging' as the S30s confidently retained their five-star recommendation. If punchy, expressive sound from discreet, affordable boxes is what you're after, the S30s demand to be heard. Happily, we've got 25 pairs of these miniature heroes to give away. Just click here to enter our competition, answer the question and you could experience some of Cambridge Audio's decades of expertise at no expense whatsoever.